At least 55 Coptic Christians died in two horrific bombings of churches in Egypt on Palm Sunday. It was a highly coordinated attack on the Christian Cross by ISIS. These Jihadists don’t just want to eradicate Jews, they want to exterminate Christians as well. I take this very personally as I have good friends that are Coptic Christians. They are gentle, caring people and this just makes my blood boil. Where is this in the media? It should be all over the front pages of American media, but it isn’t. 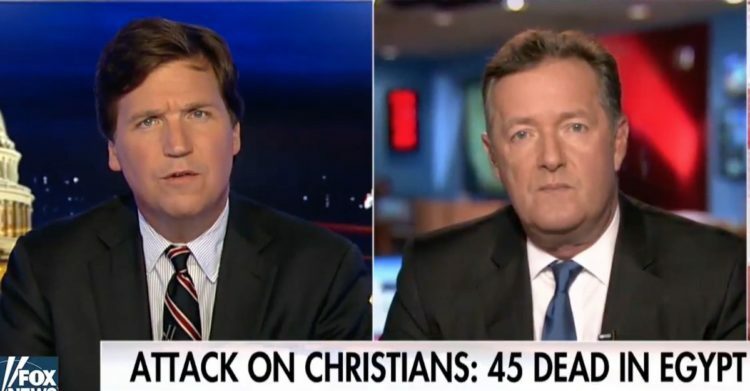 Piers Morgan was on Tucker Carlson’s show and he just bluntly said it’s because the media doesn’t care about Jihadists killing Christians. Just wow. North of Cairo, a terrorist bomb struck the Church of Saint George in Tanta claiming the lives of more than 40 worshipers and injuring at least 65 attendees. Simultaneously, the Morkussia Church of Alexandria was bombed leaving at least 15 persons dead and many more injured. After leading the celebration mass, Coptic Pope Tawadros II left the Morkussia Church minutes before the planted bomb exploded. Aside from the casualties from the Coptic population, four police officers were killed. I wept when I heard this and I know my Coptic friends are still in shock. Piers Morgan has been fascinating to watch during the Trump Administration. He is slowly realizing when leftists aren’t talking about gun control, they are bats*** crazy. They are bats*** crazy when they talk about gun control too, but that’s not the issue here. The issue is, where is the media when it comes to the Palm Sunday Attacks in Egypt (see PURE EVIL: ISIS Attacks Christians in Egypt on Palm Sunday)? You know if you look at what ISIS really stands for, what they are carrying out in the Middle East, and in Egypt in particular, is a kind of genocidal attack on Christians and Christianity. They want Christianity eradicated, and they want to convert all Muslims to their crusade, they want it to be a Holy War, and they want Christians gone. Now I think this is a huge story. This is the kind of story that ought to be dominating cable news, in America. It should be dominating headlines around the world. The press in America should be full of headlines about this. Piers Morgan is slowly waking up to the fact that this is a holy war. And that Islamists won’t be satisfied until all infidels are dead or subjugated. If Christians had killed Muslims, the media would be lapping this up… but that is never the case. And the genocide of Christians in the Middle East continues. ISIS will never stop until they are eliminated. The Pope is visiting Egypt in two weeks and they would love to take him out… it would be a huge prize for ISIS and would be a massive propaganda boost for them. I pray not only for the Pope’s safety, but for those that died last weekend and those that were injured and their families. It is incumbent on America to rid this world of ISIS and their evil… we should also not ignore Christians being exterminated anywhere in the world. Even Piers Morgan sees that.